North Carolina Workers’ Compensation Law: A Practical Guide to Success at Every Stage of a Claim, Third Edition, is now available for purchase. 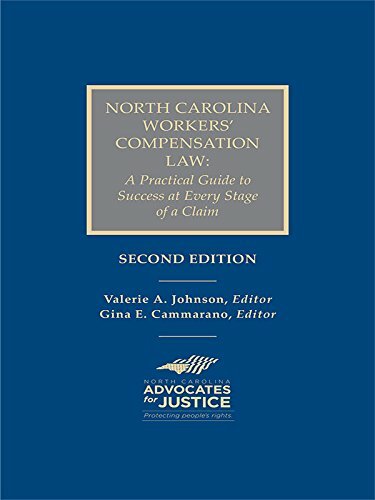 This excellent NC Workers’ Compensation Law Guide is edited by Valerie Johnson and Gina Cammarano and is published by the North Carolina Advocates for Justice. It is available in both book and electronic formats. This book is absolutely required for NC attorneys who handle workers’ compensation claims. I am glad to have contributed the article on death claims. The full Table of Contents is below. XII. DOES THE CLIENT HAVE TO CHOOSE BETWEEN PURSUING HER WORKERS’ COMPENSATION CLAIM AND PURSUING A THIRD PARTY ACTION?